Take 10% off general admission to the world&apos;s most intact public collection of a major American artist. Clyfford Still was among the first generation of Abstract Expressionist artists who developed a new, powerful approach to painting in the years following World War II. In addition to approximately 9,000 square feet of exhibition space devoted solely to the artist&apos;s work, the Museum also houses the Clyfford Still Museum Archives and the Clyfford Still Museum Research Center. The Los Angeles Times calls the Museum "a marvelous model for what a single-artist museum can be;" Smithsonian Magazine describes the Museum as "among the best art museum experiences anywhere." The Museum was designed by Allied Works Architecture, which received the 2013 Design Award, 2012 Honor Award, and 2012 Craftsmanship Award from regional chapters of the American Institute of Architects for the project. How to redeem: Present your conference badge at the Museum&apos;s reception desk to receive 10% off general admission. *The Fine Print: Not valid in combination with other offers. Pre-registration via clyffordstillmuseum.org/info required for groups of ten or more or field trips/school groups. Take $2 off General Admission tickets at the Denver Art Museum. From the iconic architecture of our building to our internationally-acclaimed American Indian collection, your group is sure to enjoy a visit. We are conveniently located in downtown Denver, just 5 blocks from the Convention Center. How to redeem: Receive $2 off adult general admission tickets for all convention attendees upon showing your badge. Take $2 off ticket for general admission. *The Fine Print: Discount for convention delegates only, with presentation of convention credentials. Cannot be combined with any other offer. Cannot be combined with Culture Pass. General admission only; not valid for specially ticketed events. See www.botanicgardens.org for early closure dates. Choose desired show, click "Details and Tickets"
*The Fine Print: All Sales are final, no refunds or exchanges. Discount does not apply to all performances or performance dates and varies based on availability and date, (productions often exclude Saturday evenings from discounts and some productions do not offer discounts). Discounted service fee of 10% applied to each ticket. Tickets must be purchased online to receive the partner discount. Tickets held at will-call are available for pickup one hour before the performance. Please note that due to the nature of live theatrical bookings, programs, dates and times subject to change. Please refer all questions to the Group Sales office, groupsales@dcpa.org. DENVER 2 for 1 TIX is a program that provides weekly 2 for 1 ticket and admission discounts for metro Denver arts and entertainment. DENVER 2 for 1 TIX is a joint program of Denver Arts & Venues and VISIT DENVER. 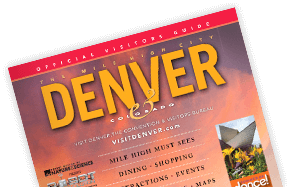 With the Culture Pass in hand, you&apos;ll receive admission to some of the city’s most fascinating attractions, all for the bargain “Mile High” price of $52.80 for a five-day pass or $30 for a three-day pass.